As a HUD-Approved Housing Counseling Intermediary, we facilitate the distribution of funds to an affiliate network of HUD-approved housing counseling agencies in Illinois, Indiana, and Missouri. In addition to securing and distributing funds from HUD for this network, we help the organizations with administrative functions, assisting each agency to ensure it meets program standards and client needs. With our support and resources, these agencies are able to help more families and create more change in their communities. Our partner agencies offer an impressive array of housing programs and services. They provide financial management and budget counseling, mortgage delinquency and default counseling, pre-purchase education, one-on-one homeownership counseling, rental information, fair housing guidance, rehabilitation programs, reverse mortgage counseling, homeless prevention support, predatory lending education, and foreclosure prevention options. We’ve created tutorials to help you navigate your quarterly reports. Respond Now, which provides immediate, short-term assistance to families in the Chicago Southland, first relied on Housing Action Illinois as a policy advocate. The social services provider looked to us for state and federal policy updates and to advocate for policies that would help them help their clients. Then, five years ago, Respond Now realized that their clients needed help with foreclosures and came to us for assistance. Together, we developed a plan for creating a new housing counseling program. Housing Action trained their staff in counseling, helped them find funding, and placed an AmeriCorps VISTA who worked extensively on their application for HUD certification. We’re proud to say that today Respond Now is both a HUD-approved housing counseling agency and part of our Intermediary network, with the capacity to serve 300 clients a year. A New Look: Western Egyptian E.O.C. Western Egyptian E.O.C. 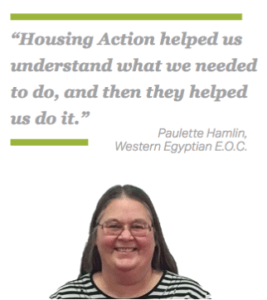 already had a housing counseling program when they came to Housing Action Illinois for assistance, but they needed help getting the word out about their services and wanted to make sure they would pass their upcoming HUD review. We helped them edit and update their marketing materials, and we helped them prepare for the HUD performance review. They were able to bring in and counsel 125 clients within a year, passed their review, and are now one of our Intermediary Affiliates.